There are a bunch of films that I’ve read a plot synopsis of, found it interesting, thought I’d try and watch it—and then taken a look at the cast, only to discover it starred someone I didn’t like. 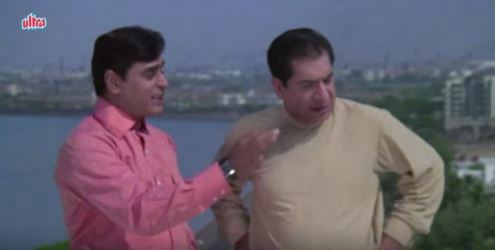 It’s happened time and again; with Talaash, having discovered that the film starred Rajendra Kumar, I decided to put the film on the back burner, even though the synopsis sounded interesting. Then, reading Anirudha Bhattacharjee and Balaji Vittal’s SD Burman: The Prince Musician, and seeing the list of songs (some of them truly lovely ones), I thought I may be able to sit through the film. 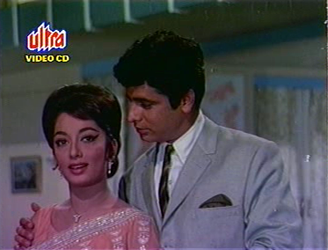 Perhaps the rest of the cast, the interesting story, and the good music, would compensate for Rajendra Kumar. Talaash begins with the graduation of Raj Kumar ‘Raju’ (Rajendra Kumar), who is being congratulated by all his classmates for having once again come first in the class. 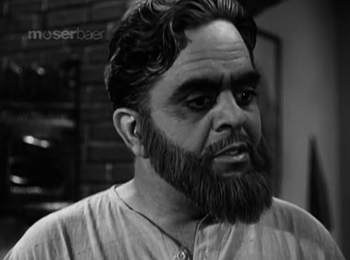 Raju goes off to meet his friend Lachhu (OP Ralhan, who also directed this film, which was produced by Rajendra Kumar). Lachhu has, after seven tries, finally managed to graduate too. They congratulate each other, and talk briefly of their futures. Lachhu will be roped in to work at his wealthy father’s cloth shop; Raju doesn’t know what he’ll do, but he’s certain: the wealth of his family will only be doubled. Yes, he’s not known want, ever, and he will continue to enjoy all that wealth, now through his own hard work. BR Chopra is one director for whom I have a lot of respect: he was one of the most versatile film makers of his time, a man whose films could not easily be dumped together into one broad category. Look at the difference between Waqt and Sadhna, for instance: one stylish and glamorous, the first big multi-starrer in Hindi cinema; the other a low-key yet impactful film with an unusual female lead. Or Humraaz, a sleek suspense thriller, and—on the other hand—Dharamputra, a commentary on secularism and bigotry and several related ills which still plague India. Whether he was conveying a message, highlighting a social evil, or simply making an entertaining film, BR Chopra was in a class by himself. 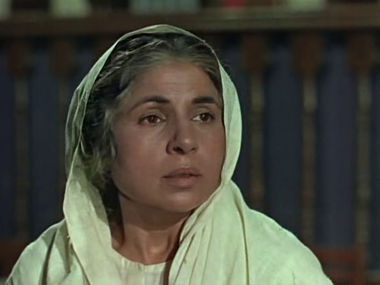 His films invariably had excellent production values; the music could always be counted upon to be topnotch (and the fact that he often commissioned Sahir Ludhianvi as lyricist meant that it wasn’t just the music that was superb, it was also the words of the songs—some of Sahir’s best songs are for BR Chopra’s films). Which brings me to this film. 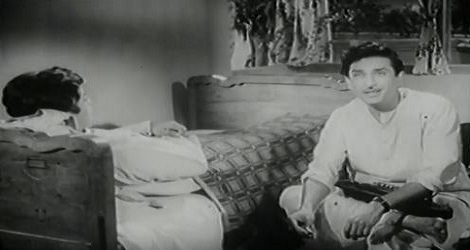 Ek Hi Raasta was one of BR Chopra’s earlier films, and while it doesn’t have the impact of (say) Gumraah or Dhool ka Phool, it is still an interesting story. I hadn’t heard of this version of the Mahabharat till a few days back (not, of course, that the existence of this film is surprising; given Hindi cinema’s love for mythology, there was bound to be at least one version of this epic floating about). Then, commenting on my jewellery songs post, blog reader Afsal posted a song from Mahabharat, and mentioned part of the cast: Pradeep Kumar as Arjun. 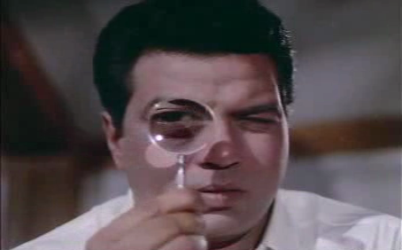 Dara Singh as Bheem. Padmini as Draupadi. That sounded deliciously unlike the usual B grade Hindi mythological, so I went looking for it on YouTube, and watched it. I won’t narrate the complete story here; the Mahabharat is too well-known for that (and if you aren’t familiar with it, I’d advise checking it out first before watching the film). Suffice to say that the film begins right in the middle of some action, without setting any preliminary background in place. 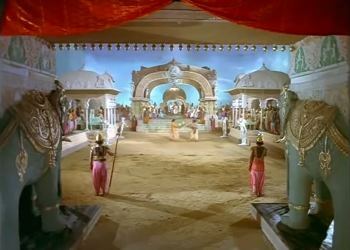 At the court of the blind King Dhritrashtra in Hastinapur, the entire court is watching the two cousins Bheem (Dara Singh) and Suyodhan/Duryodhan (Tiwari) engage in a wrestling match. 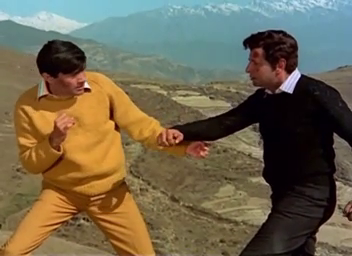 Yash Chopra’s debut as a director, Dhool ka Phool is unusual in a lot of ways. Leela Chitnis, for instance, is not a coughing-her-guts out (or basket-making) pathetic old mum. The hero and heroine travel by train—and that too in trains that go over bridges—without the train falling into the river or crashing and the protagonist losing their memory in the process. Or being given up for dead. And two people in love in the first half-hour of the film end up moving on in life and not loving each other till the end of time. On the flip side, it does have a long-lost mother feeling an inexplicable affection towards a strange boy, who for no reason that he can fathom, instinctively calls her “Ma!” It does have a thunderstorm at the end of a love song, with the expected consequences [read: raging hormones, libido and “Humein aisi galti nahin karni chaahiye thhi”]. And it does have Manmohan Krishna being the goodie-two-shoes who stands up for what is right and righteous. When Anu listed her favourite Sadhna films, I remarked that another Sadhna film I like—though it’s from later in the actress’s career—is Intequam. Based on Vendetta, a Marie Corelli novel (the only film adaptation of a Corelli work that’s in colour), Intequam is a story of vengeance. 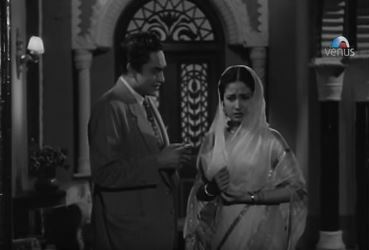 Though it features a Sadhna whose gorgeousness had begun to suffer because of her medical problems, she’s still interesting—and the central character in this film.